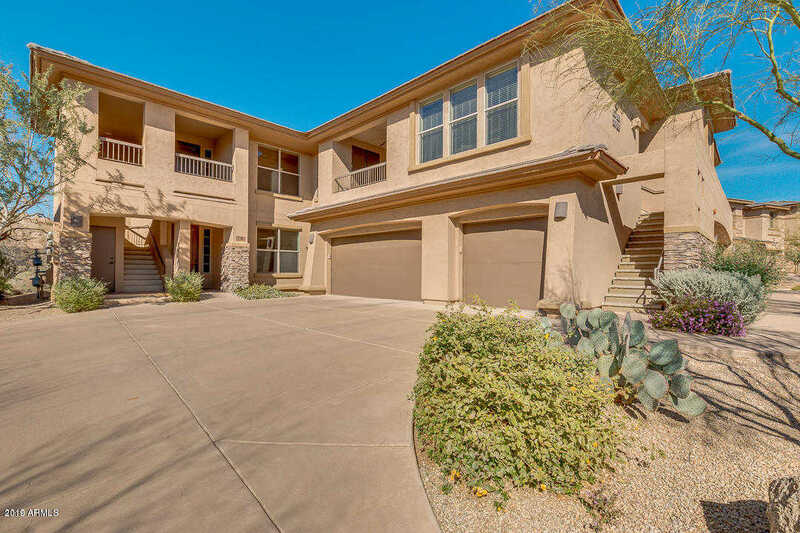 Troon North on Troon North’s Monument golf course featuring a bright and open floor plan with attached garage. The open dining and living room are wonderful gathering spaces with a cozy fireplace and hard wood floors that lead to the kitchen with granite counters, multi-level breakfast bar, stainless steel appliances,gas range and ceiling height cabinetry. The spacious master bedroom and bath features a large walk in shower, dual sinks, extended height vanity with a large walk in closet. Views of Pinnacle Peak. Within walking distance to the community facilities including fitness room and community pool and spa as well as Troon North Country Club, move-in ready home is perfect for full time residents or lock and leave. Garage is located below the unit. Approximate size: 1830.00 sq. ft. Please, send me more information on this property: MLS# 5870829 – $335,000 – 10260 E White Feather Lane Unit 2009, Scottsdale, AZ 85262. I would like to schedule a private showing for this property: MLS# 5870829 – $335,000 – 10260 E White Feather Lane Unit 2009, Scottsdale, AZ 85262.